I relate this painting to belligerence because of the hole of the top canvas, through which you can see what’s on the second canvas underneath. Through the hole you see on the bottom canvas the same red and similar white-cream color that exists on the top canvas. I view-read that to mean that the rupture—such as the psychic and/or physical damage resulting from belligerent forces—does not necessarily succeed in destroying what it ruptures. Indeed, because the two colors viewed through the hole are the same or similar, there’s an implication that the turquoise blue and mustard yellow might also exist on the bottom canvas, even though they’re not discernible through the hole. Whether or not the blue and yellow actually exist is not significant since one can’t see the entirety of the bottom canvas through the hole; what is significant is that there’s the implication—there exists the possibility if not probability—that they may exist as much as the red and white-cream colors. While the red seems the same on the top and bottom canvases, the white on the top canvas and the white-cream color on the bottom canvas are not quite the same. I read-view this to mean that survival of belligerence does not mean one is not untouched by the experience—hence, the bottom canvas’s “white” is a dirtier white: it might reflect the “dirt”-ying effect of belligerence. 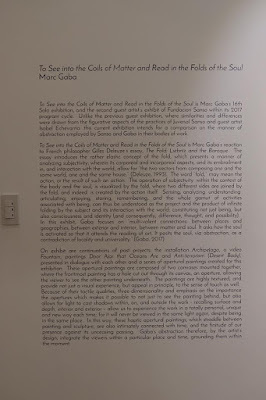 "To Deleuze, the Baroque is the operation of creating folds. Matter and the soul are infinite folds, and crucially, the two are connected. "In context and in brief, your body, caught in the matrix of matter, is your soul, and you cannot respond to this troubled world without one." 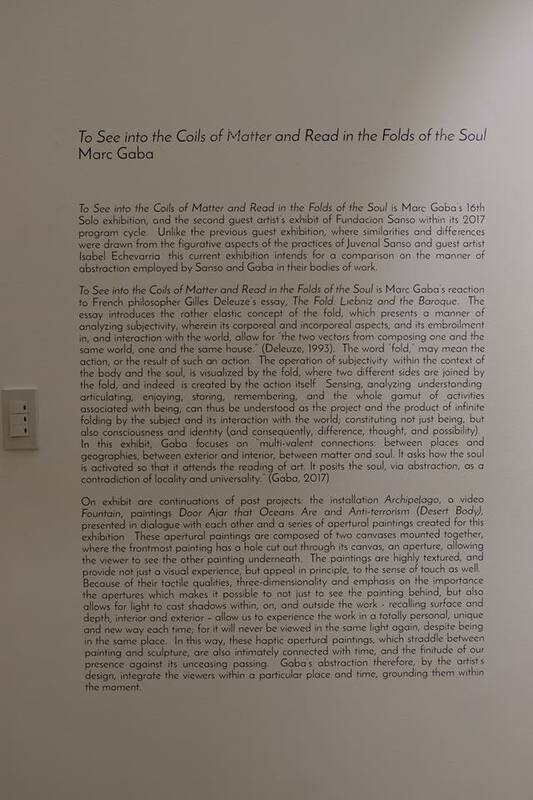 I also appreciate how Gaba’s statements indicate the depth of his root source for his dual canvases. That such thoughts are distilled into this particular painting’s non-(dramatically) baroque (or non-baroque in my eyes) image only shows the effectiveness of distillation—in the same way that, in poetry, no word is ever “simple." I will never forget we walk on the same planet and breathe the same air. I will never forget the same sun shines on us. I created my own legacy: No one is a stranger to me. 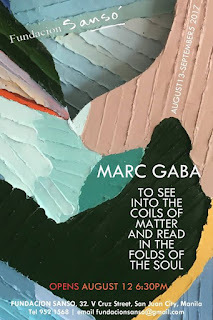 Ultimately, when I look at Gaba’s painting, I think of that Sarayaku elder’s words. 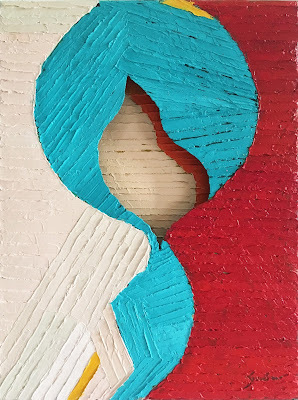 Despite belligerence, do what one must do to survive (the red exists on both canvases), and hopefully not just to survive but find ways to live joyfully (that lovely turquoise that dominates the image, an achievement when the red to its right is a more typical color for garnering a viewer’s attention). And do so with calm: “It’s just to continue living.” I’m honored and grateful Marc Gaba's painting covers the poems in Love in a Time of Belligerence (forthcoming Fall 2017).